Last week, I stopped using Word to write journal articles. Don’t get me wrong, Word has served me faithfully for many many years and it will still be part of my life. But, for writing articles….well, Word and I were not having a happy relationship. Picture the scene. Here I am at my desk, staring at my screen. I am scrolling. I keep scrolling. By the time I get to where I want to be, I’ve half forgotten why I went there in the first place. Word and I scroll for victory, but end up frustrated and defeated. This was happening more and more. A combination of being a bit rambly, and a huge, long, never ending scrolling document was not good. Thank you academics on twitter! And I started to think…I wonder what this Scrivener is all about? I checked out the website, discovered that it was created by Literature and Latte as a tool to aid the process of writing long texts. I think that it was used by the fiction writing community to begin with, but has since been adopted for blogs, theses, dissertations, articles, research proposals and more. It’s not free. It costs $40USD but you can use it on a number of machines once you have the licence. You can get a 30 day free trial. This is what I did, and I was instantly hooked. My faculty then very generously agreed to purchase it for me to trial properly at work. The rest of this blog post contains my initial views on the software and how I have used it to complete a journal article that I’ve had hanging over me since last October. Write, Revise, Edit. This is the idea behind Scrivener. It’s not there to make a pretty document that is perfectly formatted. It’s there to help you break your text into chunks so that you can write clearly, consistently and concisely. So this is how Scrivener looks. You can see on the left that I’ve broken down the text of my article into parts. I’m on the part called “Bruce Wayne” so that’s what you can see on the right. The highlighted text tells me there’s a footnote there (more of which below). I imported this Word doc into Scrivener. Dead simple. You go to File > Import and choose your file. The Word file remains the same. It doesn’t get changed. But you now have a new file based in Scrivener that you can re-structure. Just being able to see each section with a simple click and move seemlessly between introduction and conclusion makes such a difference to productivity. And you know those “miscellaneous” bits that tends to get saved in random Word files which you then can’t find? You can have those at your finger tips too. Ever start an article really well, but end up losing heart towards the end? Me too. I start strong, the footnotes are all in the right place and I know what I want to say. But then a reach a point (usually the key point!) where I lose track of what I’m saying, I can’t really remember where I wanted it to go. Back to scrolling up and down…. I started writing the article pictured above during the wonderful AcWriMo [See my AcWriMo 2015 story here and here]. It’s lovingly known as “the Batman article”. I got a really good way through but then stopped. I’ve found it hard to get back into since then. When I picked it up again (in Word) I found that I was introducing new concepts/phrases that hadn’t appeared earlier on. This gave the piece a disjointed feel. The split screen option in Scrivener (pictured below) means that I can see the language that I have used earlier on and ensure consistency throughout. This has been really helpful for me with the Batman article. I started by setting out exactly what I was going to achieve in the introduction. Using Scrivener I was able to check that the start and finish of each section achieves that, and amend where required. It’s also great for writing your conclusion. I just popped up the intro as an aide memoire whilst I typed the conclusion alongside it. 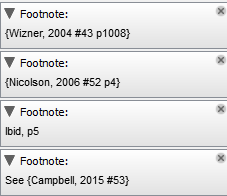 You can use footnotes on Scrivener. You can also link it to citation management software you use. I use Endnote. Each time I read a text I add it into my Endnote, so I now have a nice long list of articles and books that I like to reference. So far so good. My Endnote markup was there and I was looking forward to pressing a button and the full citation appearing on the final document. My problems started when I saved the final document as a Word doc (known as compiling). I had to do this because publishers usually want a Word doc to read. All of my references were there and I could ask Endnote to pick the particular citation format that I required. The issue was that my required format wasn’t available through Endnote and I wanted to move words and dates around. I asked Word to allow me to edit the citations. But then it just reverted to the Endnote markup. I couldn’t move the words around because the full citation wasn’t there. This isn’t really a Scrivener problem. I suspect its a Word & Endnote issue – combined with user error! I need to do a bit more playing about (and reading other people’s Scrivener blogs) to find the best way to produce those footnotes with ease. This is actually part of the title of the Batman article, but is applies here too. After 5 days, I have a fully finished 4000 word article that needs one final proof read and then it’s ready to submit to the journal. I’m delighted. I’ve started to use it to write part of my doctoral application and I already feel more in control, just for being able to see my sections & visually map out what needs to come. It’s only been a week and I hope to learn more as the months go by. Do you have any tips – especially with that footnote issue? Are there any key features that I haven’t found yet? Scrivener was actually recommended to me about six months ago by another blogger, but I here I am six months later and I still haven’t purchased it. I think I was concerned about the learning curve. I ‘m making some final revisions on my manuscript (non-fiction) and I don’t want the learning curve to slow my momentum. Still, I’m considering the free trial. Yes, it’s hard to know where to begin with new software especially when you’re so used to something else. The free trial allowed me to sit and “faff”. A riveting night for my other half with me going “ooh look at this” and “erm, I have no idea what to do”, usually in quick succession! I switched to Scrivener the week before I went to a writing retreat to finish revisions on a manuscript. I found the tutorial very helpful to get me up and running and was able to jump right in when I got to the retreat. Depending on where you are in revising, it could actually speed you up. I was able to move things around and experiment with order a lot easier in Scrivener. I have been using Scrivener for a couple of years. 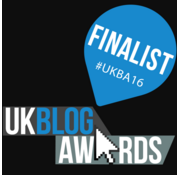 First for my novel(s), but I recently switched to it for my blog posts, too — and I love it! Joe Michaels (at learnscrivenerfast.com/scrivener-tutorials/ ) is a great teacher, and he runs quite a few free (fast) webinars if you can catch one.